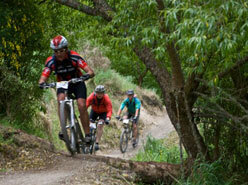 South Canterbury in the Central South Island region enjoys a diverse range of urban and rural cycling routes through urban and back country reserves, coastal tracks, river bank trails and local roads. From the thrills of fast and furious mountain bike trails through challenging terrain to gentle, low impact trails for beginners and family groups, there's something to guarantee a memorable experience for everyone. Lake Tekapo Regional Park. This 165ha exotic forest on the south east edge of Lake Tekapo was established as a Regional Park by Environment Canterbury in 2008.